A review of What Sunny Saw In The Flames by Nnedi Okorafor. Image: Niki for The Book Banque. 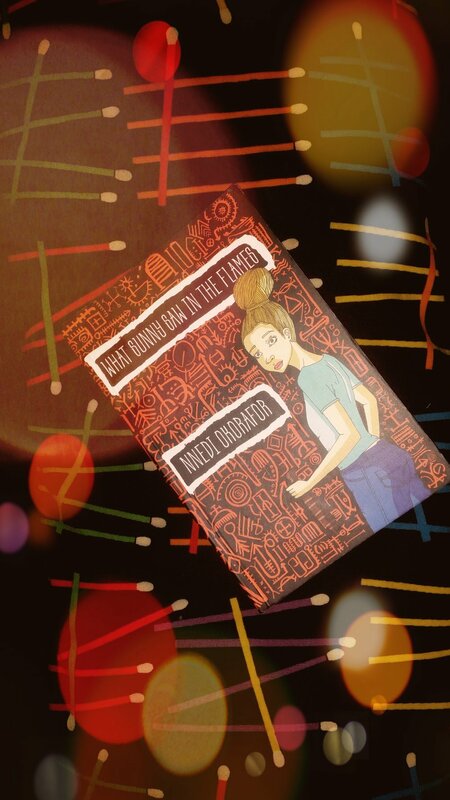 Nnedi Okorafor’s What Sunny Saw In The Flames is more than just a title; it is also the foundation of the story centred on Sunny. The prologue shows Sunny looking into the flame of a candle during a much too frequent power cut in her family home in Aba, Nigeria. Written in first person, the reader experiences all the choices she makes in getting closer to the flame, and is drawn by the shock and horror of the scene unfolding before her eyes. Much like Sunny, the reader is surprised by the flame that catches her long blonde hair; burns 75 percent of it and shrinks it to a short afro. The burning of her hair and its transition from “lovely, long” to an afro is metaphorical of the development that occurs in Sunny’s life following the fiery revelation. Admittedly, being American born, an only daughter and an albino, she is already othered in her everyday life. When at school, her skin and accent set her apart from schoolmates. At home, she is isolated by the fact that she is the only girl. Her skin, being sensitive to sunlight, prevents her from gaining camaraderie with her boisterous brothers who enjoy football. Distinction, to Sunny, is thus nothing new. At age twelve, the discovery in the flame causes a great shift Sunny’s developing adolescent psyche. Sunny’s eventual pack of friends, The Oha Coven - Sasha, Orlu and Chichi - are also adolescents connected to the magical world otherwise referred to as Leopard Knocks. Sasha, like Sunny, is an Akátáa whereas Orlu and Chichi are born and bred Aba children. The other three, unlike Sunny, have however had knowledge of their Leopard identity from birth. As such, they are a stable community in which Sunny can navigate the mental upheaval that learning to have a dual life brings. Otherwise publishedb as Akata Witch, Okorafor’s What Sunny Saw In The Flames is often dubbed by some critics as the “Nigerian Harry Potter.” Whilst I grimace at this comparison, there are indeed some parallels between the two fantasy fiction series. Sunny, much like Rowling’s Harry Potter, is young and vulnerable at the point of discovering her supernaturalism. Where Harry is bullied at home and finds respite at school, home and school are, however, both places of tension for Sunny. It takes her initiation into the Leopard Knocks to discover the possibility of fitting in. The shared age bracket between the coven also means that the stresses of adolescence — bullying, puberty, first crushes — are also shared. The coven is destined to fight an evil force wreaking havoc in the human world. Their youthfulness is presented as a war tactic rather than a disadvantage. It is used to distract the enemy so he is blindsided when they unleash their true strength. Magic, in this Young Adult novel, is not trifled with but rather, is presented as a huge responsibility. "Chittim is the currency of Leopard people. Chittim is always made of metal (copper, bronze, silver and gold) and always shaped like curved roads. The most valuable are the large copper ones, which are about the size of an orange and thick as an adult’s thumb. The smallest ones are the size of a dove’s egg. Least valuable are chittim made of gold. When chittim fall, they never do harm. So one can stand in a rain of chittim, and never get hit. There is only one way to earn chittm: by gaining knowledge and wisdom. The smarter you become, the better you process knowledge into wisdom, the more chittim will fall and thus the richer you will be. — Fast Facts for Free Agents by Isong Abong Effiong Isong"
Something intriguing — or arguably confusing — about fantasy is the author’s ability to “open strange doors” and craft mystical worlds and words. Crafting mystical worlds could be relatively tricky as the author tries to create the extraordinary without leaving the reader feeling like they are reading something ridiculous. The author also tends to fight against moulding stereotypes; in order to present the world in a balanced manner - one with the good, bad and in betweens. If in no other way, Okorafor creates a realistic society in Leopard Knocks by creating a currency system. From the excerpt alone, the reader can see differences in how currency is gained and in what is deemed valuable. In What Sunny Saw In The Flames, currency is gained through wisdom. This allows for Sunny and friends, in their young age, to acquire currency to navigate the scholastic and daily Leopard Knocks needs. This is also a system that gives all the citizens the ability to earn from the moment of coming into full Leopard identity. By simply passing the initial Leopard test, you are rewarded with chittim. This then allows you to purchase books and transport services that aid one’s understanding and navigation of the new world. Knowledge, as a foundation for wealth acquisition, takes away the role of luck and inheritance that non-mystical humans sometimes rely on. However, as with all societies, mystical or not, there are individuals within Leopard Knocks who attempt to bypass the process of learning; instead stealing chittim from unsuspecting Leopard People. With wisdom as an important trait for all Leopard people to possess, the Obi Library is situated at the centre of Leopard Knocks. Leopard Knocks is, however, just one of many hidden worlds of magic that exist around the world. The second created is on Zuma Rock in Abuja, Nigeria. Whilst Leopard Knocks is mostly inhabited by residents and natives of the region, Zuma Rock is the meeting ground of all Leopard People across Nigeria. It is the capital of the Nigerian Leopard country. In the Leopard community, there are four levels before one attains full magical autonomy. Sunny and friends are at the beginning and are trained and individually mentored in Anatov - fourth level Leopards’ huts rather than in a school structure. This means that rather than get lost within larger classrooms, Leopard children are closely monitored throughout their education, working in small groups or one-on-one with mentors. With this system, there is a good level of accountability. Additionally, Leopard children are intentionally exposed to violence. The choosing of their ‘Juju Knife’ — perhaps an equivalent of the western magic wand — comes with a degree of pain. Despite the unconventional nature of Leopard living, there remains a gender bias which Sunny combats when she takes to the field as a footballer in a historically all-boys match at Zuma Rock. Sunny, despite being one of the better players across both teams on the field, has to fight to play a sport she so dearly loves. Here, ability transcending gender is a micro-theme, and the cultural sexisms of Nigeria are reflected. What Sunny Saw In The Flames is crafted in the minute details. Okorafor pays so much attention to how the normal and mystical worlds are formed; differentiating them without taking out the cultural identities of Nigeria that make this narrative Nigerian-specific. A reader of this Young Adult novel will walk into a world that is both familiar and unfamiliar. By the end of the read, the unfamiliar is bound to become something one can navigate. It may still fall outside your purview but will sure not feel so alien. This, here, is the magic of Okorafor’s writing. The only problem, I find, lies in the last few pages where the incident of fighting the evil the Oha Coven has been groomed for occurs. These pages feel rushed, almost like a blur. It is a departure from the detailed narrative that makes up the majority of the book. It feels like a blink is all it might take to miss the end. Nevertheless, my much older self thoroughly enjoyed falling into this read — though it has been marketed as a book for 12-16 year olds. What Sunny Saw In The Flames has a certain freshness and a Nigerian aspect to it that is endearing. 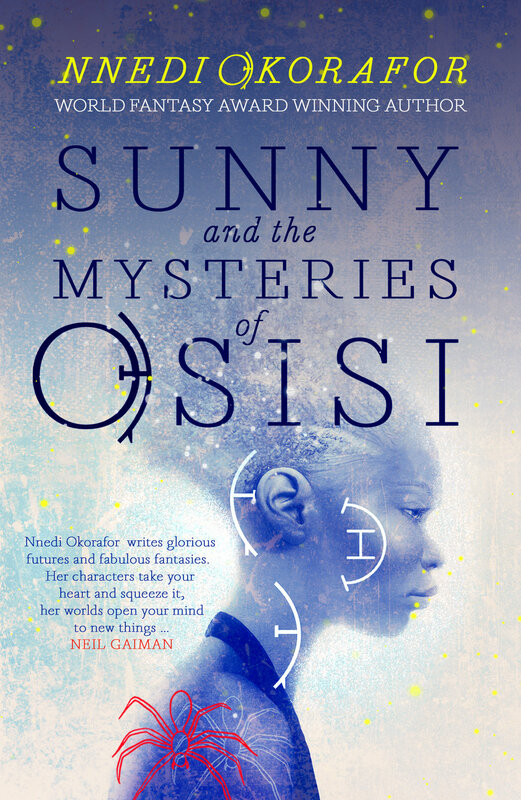 Have you read Nnedi Okorafor's What Sunny Saw In The Flames or any of her other books? How did you find it/them? Is fantasy ficiton your thing? Tell us! b What Sunny Saw In The Flames was published in Nigeria and the UK by Cassava Republic Press in 2013. It was also published in the US as Akata Witch by Speak.